Organizers for California’s high-speed train just announced that when their bullet train opens, it’ll start service out of the Bay Area, not Southern California like originally planned. The announcement isn’t a surprise—but it could prove crucial to the success of the already delayed project, which is over two years behind schedule. The Los Angeles Times reports today that the first 250-mile stretch of the bullet train will link San Jose to Bakersfield, rather than Fresno to Burbank. 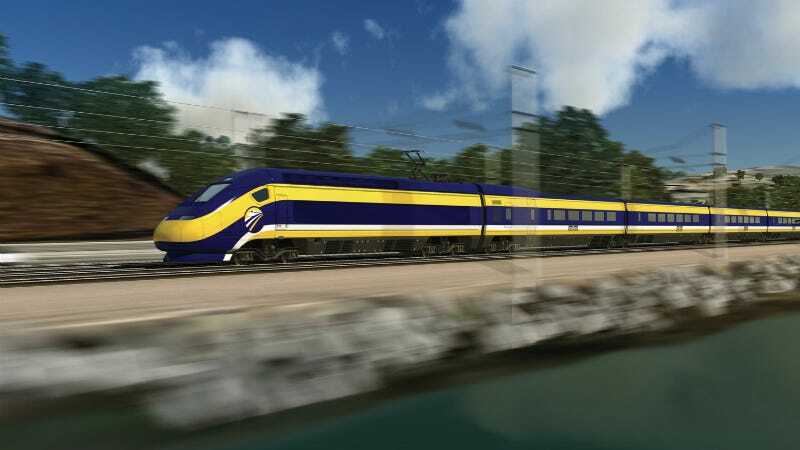 Officials for the California High-Speed Rail Authority admitted last month that construction is going to take “a little longer than we said.” The first leg of the $68 billion project is supposed to be done by 2022, and is supposed to whisk passengers from SF to LA in 2.5 hours. But this total 180-degree change could totally work out to the project’s favor by winning more public support and possibly helping the thing get done. In comparison, the Bay Area alignment is shovel-ready, plus, construction’s already well underway for San Francisco’s Transbay Center: a massive transit hub that will be Northern California’s terminus for the bullet train. The San Jose to San Francisco route is already serviced by Caltrain, which is supposed to share its network with the high-speed train. But there’s another benefit to starting up north. The futuristic HSR alternative would be a way faster, more appealing option for the increasing amount of Silicon Valley employees who live in San Francisco and surrounding cities, but work down south. This means it could definitely emerge as a solution to SF’s tinted-windowed symbols of gentrification, the “Google buses.” Get tech companies involved in a meaningful way, and there’s even more built-in public support. The California project might seem like a bunch of empty promises and a bundle of disorganization to some, but hey—unlike the bullet train plan in Texas, at least this one’s actually already being built.